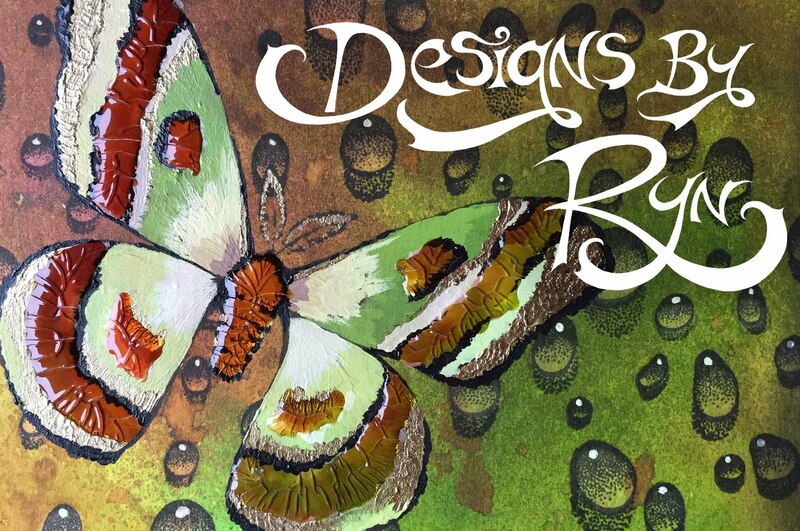 Welcome to the Designs by Ryn blog! The monthly Customer Creation Challenge can be found above in the navigation menu as well as links to my Shop, Facebook Page and Pinterest. Along the right you will find my Design Team. I hope you enjoy your visit and leave with some inspiration. I've posted the February challenge HERE. Wishing you all a month of inspiration! I've drawn the random winner for December's customer creation challenge. Congrats to Chantale Drew! Please contact me by email (designsbyryn@gmail.com) to receive your free cling-mounted stamp or stencil. You can browse my online shop HERE. Below is Chantale's winning piece using Water Droplets from my stamp collection. Thank you to everyone who contributed their art to my challenge last month! I will post the January challenge shortly and look forward to seeing your creations for this month. I've drawn the random winner of last month's challenge. Big congrats to Ellie Knol!!! Here is her winning piece. She's used my Flower Lace 1 and African Daisy stamp designs. I've also posted December's challenge. Happy creating this month! I've drawn the random winner of my October Customer Creation Challenge. A big congratulations Carole! Please contact me by email to receive your free cling-mounted stamp or stencil (designsbyryn@gmail.com). 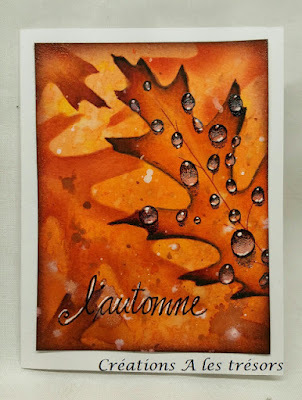 She's made a gorgeous autumn card using my Water Droplets stamp design. HERE is her blog post. Many thanks for stopping by! The November challenge is up HERE. Anything goes as long as you use a Designs by Ryn stamp or stencil in your piece. Looking forward to seeing your makes! Wishing you a great month with lots of creative inspiration! A big congratulations to Yogi for winning my September Customer Creation Challenge! HERE is a link to her blog post with more pictures of this unique tunnel book project. She's used my Hummingbird and Hibiscus designs. 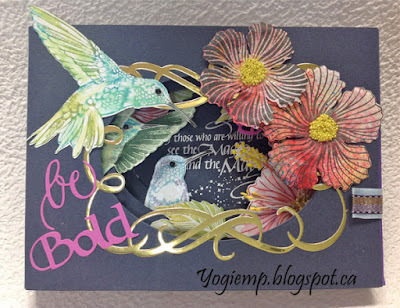 Yogi, please contact me by email (designsbyryn@gmail.com) to receive your prize - your pick of stencil or cling-mounted stamp. The October Challenge is up HERE. I look forward to seeing what you make! I am a rubber Stamp and Stencil designer from Canada specializing in deeply etched quality rubber Stamps and mylar Stencils from my own black and white drawings. I greatly enjoy creating images that others can use in their own work. I find it endlessly inspiring to see what people come up with as every perspective is different on the same design. I also find it heart warming to see and hear how happy people are to be exploring their creativity. I am an independent company and still manage everything myself. I feel lucky to collaborate with 8 talented ladies, Alie Hoogenboezem-de Vries, Anja Hardenfels, Eileen Godwin, Karin van den Broek, Kellie Colegrove, Miranda Degenaars, Shirley Deatcher and Wendy McCarthy who regularly share their art using my products and who make up my Design Team. Their blogs are listed beneath this bio. In this space I'll be sharing creations of all sorts using my Stamp and Stencil designs and news about what I'm up to. I would love for you to leave comments and to get in touch with any questions or comments. Wishing you lots of fun creating!